You’d think with all the water we have in our Northwest clime we’d see a lot more representatives of Testudinae here. Unfortunately this is not the case. Our abundance of H20 comes at a cost, well known to us natives, in sunshine. Turtles may love water, but they adore sunlight almost as much, a quality we definitely lack for a good portion of the year. 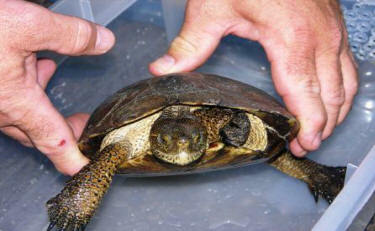 Basically, we have three species: the Red Eared Pond Slider, the Painted Turtle, and the endangered Western Pond Turtle. Snapping Turtles have reportedly been introduced and are found in isolated pockets in Oregon and Washington. But there is one surprise. According to the Audubon Society Field Guide to North American Reptiles and Amphibians the giant, half ton Leatherback Turtle is seen along our coast as far north as British Columbia. Now that would be a sight to behold! The Painted Turtle on the left displays the distinctive red and orange blend that give it its name. In the middle is the unmistakable red ear of the Red Eared Slider. And on the right is the speckled and exceedingly rare Western Pond Turtle. This particular specimen was brought to the Northwest Trek Park after being found wandering around a convenience store parking lot. But unless you have special equipment, time, and a lot of luck you are far more likely to see our three most common representatives: the Red Eared Slider, the Painted Turtle, and the endangered Western Pond turtle. These three chelonians are collectively grouped in the family Emydidae, a very diverse, worldwide gang of shelled reptiles that includes the box turtles as well. Sliders and Painted turtles are by far the most common of the lot, sort of like the garter snakes of the turtle world and subspecies of them are found throughout the US. 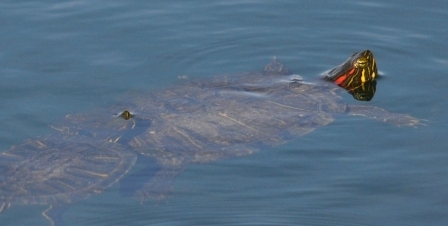 The Western Pond turtle is a much rarer commodity. The Peterson Field guide even opines that it is probably extinct in western Washington. 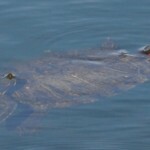 I have seen proof (see photo) that this is not the case, but the turtle is exceedingly rare. 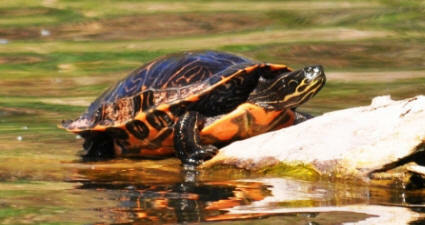 Red Eared Sliders and Painted turtles are often mistaken for one another and not surprisingly. Languidly sunning themselve on a log or exposed rock they both appear identical – nondescript, shiny black turtles. And unless you know how to approach a basking turtle that’s about all you’ll see, too. Water loving turtles are amazingly alert creatures with excellent hearing and in my experience pretty good eyesight to boot. At the slightest disturbance they plunge into the safety of their aquatic home. Try getting to within twenty feet of these guys without the utmost stealth and you will fail. But if you do have the opportunity in whatever environment for a close observation the differences are soon apparent. The Red Eared Slider has, of course, the distinctive red marking on the side of its head. 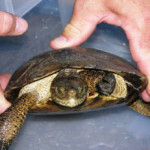 The adults are dark colored and have more uniform dark shell but the young are the cute little green fellows that were common in pet shops some years ago. (Thanks to the salmonella scare pet shops are only allowed to sell specimens larger than six inches in carapace length.) These guys run about 8 to ten inches in length out here in the west, but on the east coast I have seen huge specimens with a carapace length approaching two feet or more. Painted turtles are aptly named, and perhaps even more appropriately than their red eared brethren. The shell is a lovely mosaic of red orange lines that swirl about the dark top of the reptile’s carapace while the bottom of the shell truly resembles and artistic creation of Halloween colors. The shell is also smoother and glossier than that of its red eared cousin. Painted turtles are generally smaller than the sliders and run close to the eight inch mark. The shell of the Western Pond Turtle is not as darkly colored as its cousins, but the most notable difference is the speckled appearance of the animal’s head and neck as opposed to the yellow stripes seen in the painted and sliders. 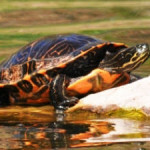 Painted and Red Eared Sliders make fine pets – with several caveats. Forget about the Western Pond Turtle, though. It is illegal to keep this endangered animal. In the rare chance that you do somehow find one of these guys please notify the Fish and Game Department. Diet wise all three of our chelonians are similar and happily munch down on snails, worms, tadpoles and just about anything small or slow enough for their beaked jaws to capture. But be sure to provide some lettuce or other green vegetation especially as your pet gets older. They like their veggies. There are several good commercial diets available that provide the necessary nutrients, but there is nothing like the real thing to keep your pet’s life interesting and to highlight your enjoyment, too. With care feeding is generally not a problem. What comes out the other end, however, is a problem. Turtles are messy eaters utterly devoid of dining etiquette and merrily rip their meals to pieces. Now that might be something you can live with but once dinner has passed through the testudinae digestive system the resultant mess can easily foul even a large aquarium. Some guides even recommend feeding your pet in a completely different enclosure than its permanent quarters. Not a bad idea. Then there is the issue of sunlight. Turtles need sunlight and lots of it. Commercially available ultra violet lights work as a substitute, but there is nothing like old sol to keep your pet healthy. Temperature is another matter that must be taken into account. 75 to 85 degrees is about optimal; if you have an indoor pet that issue tend is solved with a with a small heater or heat lamp during cold weather. Take care in warm weather, though, that you do not cook your reptile with too much heat. But what do you do with your shelled friend in an outdoor pond when the cool Northwest rains begin? If bringing the animal inside to a warm environment is not an option the next best thing is to provide a natural environment for the turtle to overwinter in turtle style. In the wild these guys burrow into the mud and hunker down for the winter. So if you have a natural pond the problem is solved. Most manmade ponds, however, have a liner and that is hardly the best substrate for a turtle burrow. A solution is to put a temporary substrate in the pond by lowering a flat pan or some kind of pot into the bottom. This will give your pet at least something to dig into and hold onto during the long cold winter. The sources I have consulted recommend that you only allow a healthy, somewhat mature turtle hibernate. Bring the little guy inside. On the subject of hibernation you might wonder how your turtle is able to breath while hunkered down under all that mud and water. Well it is breathing – through its skin. You will note that a turtle’s skin, especially those areas nearest the shell is not scaled like a snake or lizard; it actually looks and feels like skin. Like an amphibian your turtle can actually breathe to some extent through this permeable skin. This ability plus a much lowered metabolism are what gets the turtle through the winter despite being underwater. They’d obviously drown otherwise. If you do decide to adopt one of these beautiful animals as a pet be prepared for the long haul. With care your shelled buddies will be around a long time. Thirty to forty years is about the norm. Now that’s a pet you can really get to know.